I’ve always been fascinated by train journeys and train platforms, railway stations and the like. That said, I have a fondness for Indian Railways; part of it because I feel there is something so earthy, bucolic, rustic and real about them. There are many train journeys that I’ve been a part of. Also, train journeys to me are synonymous of the windows and a plethora of little stories unfolding through the small outlet. Each time the train passes by of a rural station, sights of narrow lanes and a farmer or ladies carrying a pot of water on their heads fascinate me. While often passing by small, unknown stations, I’ve seen groups of young children waiting to catch a glimpse of the train. 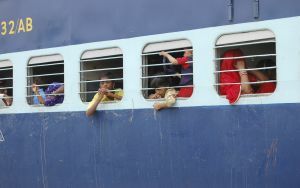 If you are traveling by the Sleeper class, many a times; you can wave back to these unknown friends. For most of the times, we’re all so occupied with lives, that there is no time to relax. Another thing I like about train journeys is passing through sights of mountains, hills, plateaus and the like. When one has company, it can be so beautiful doing nothing; but keeping your eyes gazed on the passing sights of wonderful delights of nature. Just the fact that you can wear plain cotton trousers and a comfortable tee shirt and stare outside the windows can sometimes be a striker for your dwindling creativity. Getting down at train junctions, looking at the people on the platforms, buying various kinds of foodstuffs at all stations; all are little pleasures of life that a train journey gives. It is also a good place to see how many different kinds of creatures; and when I say different, I mean distinctively different human beings exist. Some are quiet, some outspoken, and some are happy; going to meet their near and dear ones and the others, sadly returning back from the meeting. Beautiful it can be; the simple joys of life. A train journey is one of them…and I simply love them! …Except when a loved one leaves you and goes far away, miles apart…I’d like to give a suggestion here: always go with your loved ones and sit up and talk the evening and enjoy the light evening shadows falling and dissolving into nightfall. I always look forward to having a train journey with a loved one in tow. They never fail to fascinate me. Thanks Geetashree, for your comment. Train journeys can be very charming and more interesting than air travels. Thank you, Vimala, for your two words of wit as always! Yes, you are right. Train journey is one thing the romance of which is yet to be replaced by technology, except in speeding bullet trains. Train journey fascinates you and you fascinate your readers with your blogs...i remembered my last train journey with gang of my cousins and we were all teasing and troubling each other all the way...travelling alone and enjoying nature is also fun...i agree train journey is always fun but very long journeys can be quite exhausting.